Germanwings co-pilot Andreas Lubitz, suspected of deliberately bringing down the plane with 150 people on board, suffered depression and underwent psychiatric treatment, German media report. Lubitz had spent 18 months overall under psychiatric treatment, Bild reported on Friday, citing anonymous sources within Lufthansa, Germanwings’ parent company. The pilot was diagnosed with a "severe depressive episode" in 2009, the German daily says. It claims it got access to Lubitz’s profile, indicating the pilot had “psychological problems” and required a "special, exemplary regular medical examination." Bild also cites sources familiar with the investigation, saying that Lubitz suffered from a "personal life crisis," following a recent breakup with a girlfriend. Lufthansa CEO Carsten Spohr told journalists on Thursday, that Lubitz was “100 percent” fit to fly. Spohr mentioned the pilot had a pause in his training six years ago, without offering further explanation. German reporters found Lubitz’s former classmates, who said he took a six-months break from training due to "burnout-syndrome" or “depression,” Der Spiegel's Matthias Gebauer wrote on Twitter. Most of Lubitz’s friends and acquaintances described him as a "normal" and "very nice" young man and were shocked to learn he could have willfully crashed the plane. Düsseldorf University Hospital said in a statement on Friday that the co-pilot of the Lufthansa A320 plane was its patient from February-March 10, 2015, DPA news agency reported. “Reports telling that Andreas L. [Lubitz] received treatment against depression at our clinic are inaccurate,” said a hospital spokeswoman, adding that “it was diagnostic tests.” Its director Klaus Höffken said the clinic will assist the investigation in an “active and unconditional” way. Germanwings did not receive the sick note of pilot Lubitz that would have covered the date of the catastrophe in France, it said on Friday. “Media reports say that the co-pilot on FU 9525 had a sick note for the day of the accident. Germanwings would like to clarify that no medical note was presented to the firm for this day,” the airline said. Investigators have meanwhile searched Lubitz’s home in Dusseldorf and also his parents’ home in the town of Montabaur. The police do not disclose what exactly they have found. They were seen leaving the Lubitz family home carrying big boxes, plastic bags and a computer. On Thursday, Marseille prosecutor Brice Robin said Lubitz acted "for a reason we cannot fathom right now, but which looks like intent to destroy this aircraft." "He had... no reason to stop the pilot-in-command from coming back into the cockpit. He had no reason to refuse to answer to the air controller who was alerting him on the loss of altitude," Brice said, as cited by Reuters. The captain of the Germanwings plane tried to break the locked door to the cockpit with an ax, a security source told Bild. Germanwings has confirmed that an ax was among the equipment available to its pilots. A number of international airlines have announced they are adopting a new rule requiring two crew members to always be present in the cockpit. 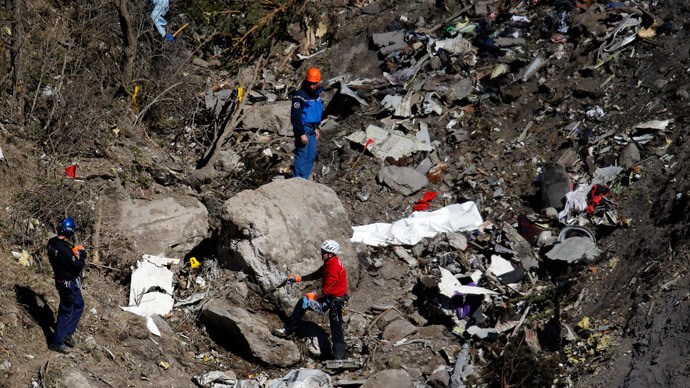 If the investigation confirms Lubitz’s actions were deliberate, Germanwings could face multimillion-dollar compensation claims. A typical airline liability is limited by around $157,400 for each passenger who died in a plane crash, but relatives of the Germanwings flight 9525 victims could go to court, accusing the company of negligence and demanding bigger payments. Potential lawsuits could focus on whether Germanwings properly screened the co-pilot before and during his employment, and if the airline should have had a policy requiring two or more people in cockpits at all times during a flight, lawyers who have represented families in past airline disasters told Reuters on Thursday.